Bali Devi’s kitchen is a sight. A sudden rush of morning water supply has flooded it ankle-deep. The utensils kept on the floor are a mess; the provisions have been shifted to the first floor. The uncontrolled gush is because a forceful water supply has broken the tap. At least twice a week, Bali Devi has to suffer this torrent. The situation is no different in other houses of Bhil Basti at Jodhpur city’s Sojati Gate area. The basement of U S Boot House in the same area in Rajasthan is also flooded. The cause of this deluge is seepage of groundwater. The loud groan of four motors that pump out water round the clock is deafening. But there is no alternative. If the owners stop pumping out water, the basement would be about 1.5 metre under water within a day. 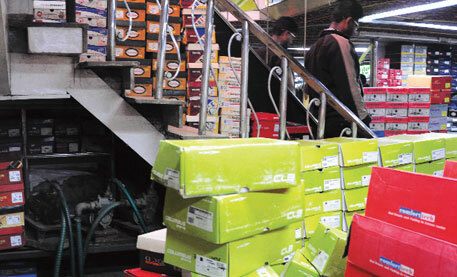 “In case of power cuts, the store suffers immediate losses,” says Harish Vyas, a business partner. Artificial flooring is how he keeps business afloat. The store is located in the city’s prime area. Shifting out, therefore, is a poor business proposition. Once crying for water, Jodhpur has too much of it now. The water table is 2.4 metres below the ground level. Dig a tubewell and get a lake, say residents. Digging for minor construction, phone or electricity lines can push water up in the form of fountains. Government officials and scientists fear a high-intensity earthquake might wreak havoc in the city. Cracks have started appearing in some city walls. During monsoon last year, the Barmer-Jodhpur state highway got flooded with rain water. As an immediate solution, the Jodhpur Development Authority has installed pump sets at 64 points in the city. According to an estimate by the Ground Water Department (GWD), 29 million litres of visibly clean water is pumped out daily, most of which is drained into sewage lines. 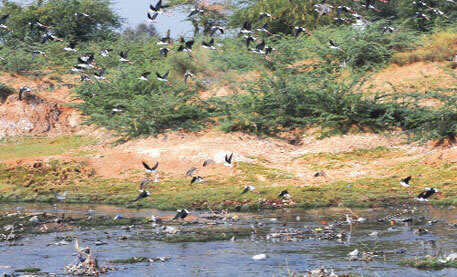 Overflowing sewerage has resurrected the Jojari, a seasonal river on the city’s outskirts. Its course had been untraceable till recently. The river water is now a stockpile of filthy sludge. This water has entered the premises of a primary school in Thotawas village. Its 60-odd students have shifted to one corner and enter the school through points created on its boundary wall. The area has become a breeding ground for mosquitoes. A large number of malaria cases have been reported from the village. When the school authorities complained, they were told nothing could be done about it. The school was built on the Jojari’s course in 2008 when the river did not exist. Low-lying fields have also fallen prey to the river’s dirty water. Using its water for irrigation, some farmers have experienced bumper crop. They have accepted the Jojari’s resurrection as a boon. 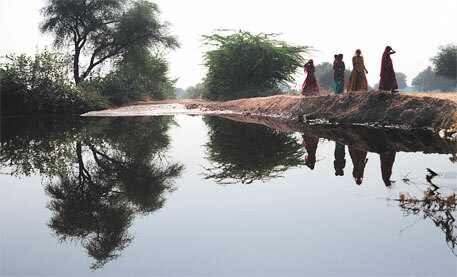 In Binayikiya, on the outskirts of Jodhpur city, seven pump sets lift water from the Jojari. Nets are used to block gutka packets and other forms of plastic. Women here are busy plucking cauliflower, third time in a row this season. Not long ago, Madandas Sharma, a farmer at Melva village, would get 40 kg of wheat for one kg of seeds. In 2011, the yield was a bumper 100 kg for the same amount of seeds. Farmers now want to grow cumin seeds and mustard. They have started channeling sewage water with mud embankments. But the water will cause losses in the long run, says Chimnaram Bishnoi, a farmer in Thotawas village near Melva. Comparing the situation with that of neighbouring Pali district, Bishnoi says farmers experienced similar boom in crop production using the dirty water of the Bandi, a seasonal river. But after a few years, the fields were rendered useless as arsenic and mercury settled over the soil. In 2004, Central Groundwater Board (CWG) found that sewage, including industrial waste from dyeing units, had entered Pali’s aquifers turning the Bandi into a chemical sludge. 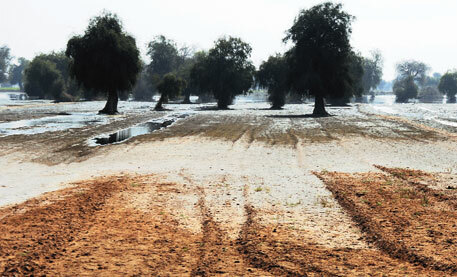 Overflowing sewage has entered fields in parts of Jodhpur and formed sludgy lakes altering the area’s ecological balance. Farms in Thotawas, Doli and Melva have turned into a makeshift habitat of Siberian storks. One can see flocks of wild pigeons, cattle egrets and other water birds in a new waterhole along the Jodhpur and Barmer district border near Melva village. Black bucks are already avoiding the lake after many died drinking its water. The city officially generates about 283 MLD (million litres daily) of waste water. Of this, 70 MLD of domestic waste water is treated by two sewage treatment plants (STP). Industrial waste is dumped untreated into the river. The waste is generated mostly by dyeing and steel polishing units. Jodhpur has three STPs, of which one is non-functional because of excess generation of sewage water. The other two have not been functioning properly for the past five years. Operators of these two plants have been served many notices for not meeting standards. The two STPs have a capacity to treat only 40 per cent of the sewage. “The rest goes untreated to the Jojari,” says a Rajasthan Pollution Control Board official. “We now have marked Rs 9.63 crore for laying pipelines to separate industrial and domestic waste,” he adds. The fate of STP will have a direct impact on the river. In 2009, the government asked experts to solve the mystery of the city’s rising water table. The most plausible reason was excess water supply. The city was once drought-prone. To salvage it from the crisis, in 2003 the Jhelum’s water was brought to the city and three adjoining villages through the Indira Gandhi Canal System and Kailana Lake. Studies by the Central Ground Water Board (CGWB) show a link between increased water supply and uncontrolled sewerage networks. The canal brings about 250 MLD water to Kailana Lake. If this water is not used, the lake will overflow. “If water supply to the lake is reduced the three adjoining villages, which are mostly dry, will suffer,” says N K Jain, divisional commissioner of Jodhpur. Incidentally, Jodhpur is the constituency of chief minister Ashok Gehlot. The CGWB study says increasing urbanisation has led to overburdening of sewerages. Recently, 273 villages on the city’s outskirts were brought within its municipal limits. This would ensure that the city would now be treated as a commissionerate. With growth of commercial as well as residential areas, increased supply would eventually contribute to the water table. Studies of ISRO and BARC say Kailana Lake’s elevation could be contributing to increase in groundwater. The lake was constructed in the late 19th century on top of the Marwar range of the Aravallis. For years, water from the lake has been penetrating through the gaps of impervious rocks. Right below the lake is Jodhpur city. “When water in the lake increases as a result of lifting from the Indira Gandhi Canal, water table in Jodhpur rises,” says J R Sharma, an ISRO scientist. The GWD dug two wells about three km from the lake to monitor the rise in water table. Both show rise when the lake has excess water. The isotopic composition study of the groundwater by BARC also interprets a relationship between the city’s interior and the lake. The National Geophysical Research Institute (NGRI) completed a similar study in November 2010. It acknowledged ISRO’s satellite imagery finding that there were faultlines between rocks below the Kailana Lake. However, it said the faultlines were far too short and complex to reach the city’s interiors. The study suggests that efforts should be made to understand the city’s groundwater regime. Conflicting results of all the studies prompted Yashwant Devda, of non-profit Jan Jagruti Vikas Seva Samiti, to do his own research. As a voice of small-time business owners in Sojati Gate, Devda has filed RTI applications since 2009. He found that in the dry regions outside Jodhpur city, too many bore wells have been dug up. Some have reached deep down the impervious rock layer. Water from this layer is used by people, but all of it settles above the impervious layer leading to excess of groundwater. Devda uses papers presented during a meeting of the American Geophysical Union in the US, in 2009. The study was published on December 2009 as an abstract in the American Geophysical Union, Fall Meeting, 2009. Ancient records show existence of a highly scientific water supply system. The Rajput rulers had constructed a series of connected baolis (step wells) across the city. It ensured ample water to the entire city. An article published in the centenary edition of Suryanagari Jodhpur, a collection of articles on the evolution of Jodhpur by Prakash Purohit testifies this. With time and growing population, the baolis fell out of use and became storages of refuse. The connection between the baolis was severed leading to overflow in the surrounding areas. The government is yet to find a solution to bail the city out of its predicament. However, on February 2 the Ministry of External Affairs signed a memorandum of understanding with AFD (L’Agence Francaise de Développement), a French development agency, to reorganise the city’s water supply. The agreement comprises Rs 4.64 billion loan to support Rajasthan’s public health engineering department. In addition, Rs 12 crore has been earmarked to develop the Jojari. 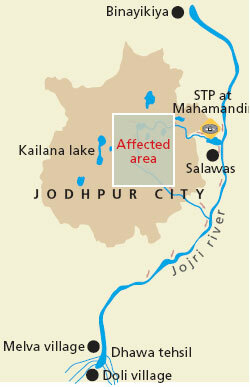 The Jojari project will focus on river drainage, constructing retaining walls, providing storm water outfalls, ghats and jetties, reclaiming 162 hectares of land, providing interceptor sewers, creating parks and gardens, designing new streets and promenades with better street lighting besides providing housing for the economically weaker sections. The city’s developers believe the plan would take at least three years to be executed. On its part, GWD says the pumps it installed at 64 points in the city have yielded results. In reply to an RTI query in May last year, the department said water levels in basements have reduced. In January 2011 it was recorded 1.45 metres and in May 2011 it had come down to 0.05 metre, it said. When Down To Earth visited U S Boot House, the water level was 1.21 metre. Residents of the affected areas in the city now fear monsoons the most.